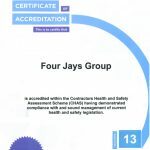 We are happy to announce that Four Jays was awarded accreditation for the second year in April 2018. This follows a thorough audit of the safety systems we employ in our business, instigated over recent years and continually monitored and improved. Please click for our Commercial Hire products.